Francesco Clark was a twenty-four-year-old with a bright future when he went to the Hamptons for the weekend. A nocturnal dive into the pool's shallow end changed everything.Paralyzed from the neck down, doctors announced that he'd never move from his bed or breathe without assistance. But Francesco fought back. Within days, he was breathing on his own. His father, a doctor himself, investigated everyopportunity for experimental treatment, and Francesco used all resources available to speed his recovery. To avoid having his lungs suctioned, he sang, loudly, for hours. And that was just the beginning.Francesco's accident left him unable to sweat out toxins, leaving his skin less than healthy. So Francesco and his father began to experiment, and Clark's Botanicals skin care line was born. It is now sold nationwide in stores such as Saks Fifth Avenue and Fred Segal, and featured in Harper's Bazaar, Vogue, andother magazines.Seven years after the accident, Francesco continues to improve, in addition to running a thriving business. 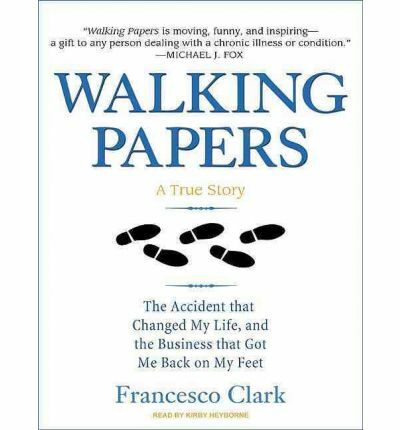 About the Author: Francesco Clark is the founder of Clark's Botanicals, which has been featured in the New York Times, Harper's Bazaar, Vogue, and many other publications. His company has won Fashion Group International's Rising Star Award, Allure's Best of Beauty Award (two years in a row), Fitness Magazine Beauty Award, Self Healthy Beauty Award, Cosmetic Executive Women's Indie Brand of the Year 2008, and Wallpaper's design award. An ambassador for the Christopher & Dana Reeve Foundation, he lives in Bronxville, New York. Kirby Heyborne is an accomplished actor, musician, and comedian. He has received critical acclaim for his starring roles in the award-winning World War II drama Saints and Soldiers, the lighthearted family comedy The R.M., the award-winning boy-band mockumentary The Sons of Provo, and the award-winning quixotic comedy Pirates of the Great Salt Lake. He has had starring roles in thirteen features and many short films. Kirby has also appeared on the WB's Everwood and many national commercials. Recently, Kirby was seen as a recurring character on the hit FOX sitcom Free Ride. Kirby has received a number of AudioFile Earphones Awards for excellence in audiobook narration. He has narrated such titles as Nick and Nora's Infinite Playlist by Rachel Cohn and David Levithan, Black Swan Green by David Mitchell, Breathers by S. G. Browne, and The Genius by Jesse Kellerman. Kirby is a cofounder and director of the celebrated Los Angeles&ndash;based improv comedy group The Society. Also a successful musician, Kirby has released four solo albums and has had his music featured in many films. Kirby has delighted audiences across the country with his ability to blend heart-warming stories, beautiful music, and comedic wit. Note: the structure of this mp3 audio book is mp3-cd. This means it will only run on computers with CD-ROM or DVD drives or CD players that are fitted to play mp3-cds. It can alternatively be cloned from a personal pc to an mp3 player like an iphone ipad sony rockbox ipod sandisk or corresponding player.